Quebec’s cannabis retailer on Thursday pulled the plug at least temporarily on a video visible by people walking by its stores that outlined the effects of marijuana using words such as calming, relaxing, energizing and euphoric. The video was being shown on display screens set up in such a way that they could be seen from outside at all 12 Société québécoise du cannabis stores across the province. The removal came as the province’s Health Department began investigating the video after the Montreal Gazette contacted it Wednesday to determine whether the video contravenes Quebec’s cannabis law, which restricts the advertising of marijuana. Flouting the law could result in fines of $5,000 to $500,000. A Quebec public-health organization is calling for the video to be permanently removed, complaining it clearly constitutes advertising aimed at selling more cannabis, in contravention of provincial efforts not to promote the use of the drug. Quebec put cannabis advertising restrictions in place in part to avoid the targeting of minors or adults who have not already entered the part of retail outlets where cannabis is sold, an area behind frosted glass that blocks the view from the street. Quebec’s Cannabis Regulation Act restricts direct or indirect advertising for the promotion of cannabis, including advertising intended to provide consumers with factual information, such as the price and “intrinsic characteristics” of cannabis. Advertising that is permitted may be disseminated “by means of signage visible only from the inside of a cannabis store” or in printed newspapers and magazines that are sent and addressed to an adult identified by name, Gardère added. On Wednesday, the SQDC insisted the video respected all regulations and was educational and not advertising touting the beneficial effects of cannabis use. But the SQDC decided to take it down Thursday after the Gazette published an article about the video, said Mathieu Gaudreault, a spokesperson for the Société des alcools du Québec, which oversees the cannabis retail network. He said that could involve changing the video or moving the screens. On Wednesday, the SQDC said the Health Department has been consulted about all the information presented in cannabis stores, a claim later disputed by health officials. On Thursday, Gaudreault said in fact the Health Department did not approve all the information. Rather, in-store info displays were developed based on training material for store employees, which had been put together “in collaboration with the Health Department and other experts,” he said. Quebec’s Health Ministry is responsible for applying Quebec’s cannabis law. The department is “in contact with the SQDC” and will “properly analyze the situation,” said spokesperson Noémie Vanheuverzwijn. It’s unclear how long the SQDC review and the Health Department investigation will take. 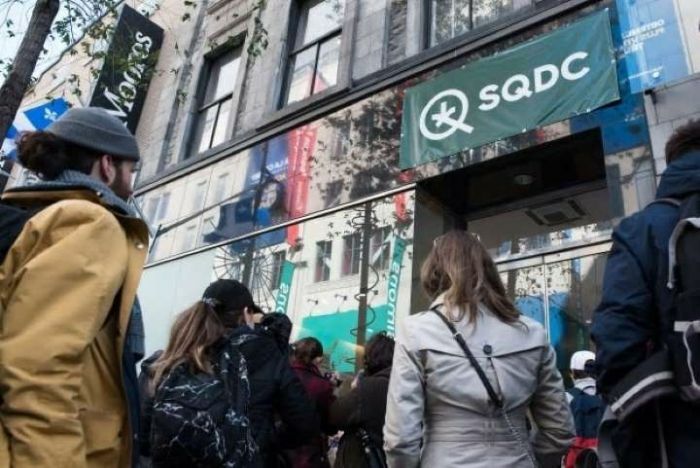 The SQDC should have known better, said Émilie Dansereau, a spokesperson for the Association pour la santé publique du Québec, a non-governmental group that has raised concerns about the health impact of cannabis legalization. “Without a shadow of a doubt, it contravenes Quebec’s law,” Dansereau said. Dansereau dismissed the SQDC’s initial claim the video is educational. Dansereau said Quebec has strict rules about advertising to avoid such promotion of cannabis use. “The more you’re in contact visually with something that reminds of a product the more there’s a chance that we’ll consume it,” she said. Lionel Carmant, Quebec’s junior health minister, is days away from introducing a bill that would tighten Quebec’s cannabis law — by increasing the minimum age to buy or consume marijuana from 18 to 21, and by banning cannabis use in public places such as parks. She referred questions about the SQDC’s video to the office of Finance Minister Éric Girard, whose department oversees the SQDC. A spokesperson for Girard did not return messages. The federal Cannabis Act also sets strict limits on the promotion of marijuana. For example, cannabis stores may not “promote cannabis” in places where young people may find themselves.